“completeness, soundness, welfare, peace.” It is translated “success” and used as part of an inspired blessing in 1 Chronicles 12:18. Shalom is applicable to an external peace between two entities—such as individuals or nations—and to an internal sense of peace within the individual. Most days in North Minneapolis are closer to Jesus’ statement, “in the world you will have trouble…” Gun violence seems out of control and I feel powerless to stop it. Women are often verbally accosted. My love for God tells me I’m supposed to love my neighbor, but: “Because of the increase of wickedness, the love of most will grow cold” [Matt 24:12]. Many days I’m wondering when God’s judgement will fall, and wishing He would hurry up. In our prayer meeting this morning we were led to Isaiah 28 and Haggai 2. Isaiah 28 is where God mentions He is going to send a storm to wipe out existing corrupt power structures, and destroy what man takes pride and safety in. He will establish Himself as the chief cornerstone, and a sure foundation. Haggai 2 reminds Zerubbabel to get busy about his mandate, which is to rebuild God’s temple. God has been sending him reminders in the form of “lack” to push him towards accomplishing his goal, but Zerubbabel is on a 14 year hiatus and seems to be more concerned about building his own paneled homes. As we were praying and reading, a torrential downpour hit and reminded us that God sees the corruption around us. He is not blind. He is the God who sees, and he is coming again to judge us all. He will establish justice and righteousness on earth, and it’s our job and our time to get busy about the fathers business. Just as Zerubbabel was to get busy about building God’s temple, we are to be about the business of making disciples. God is saying: test me. from the time you lay the first foundation stone, see what happens. Get going! A young man was shot in the leg while taking out trash yesterday. I recognized the address at being close to my friend “Kim’s” house and I was concerned. Another friend and I decided to stop here first and check in. Her family was all safe (thank God), and she was thankful for the visit and the cookies. We were able to pray with her and her daughter, and they stated they would like to come to church with us this Sunday. 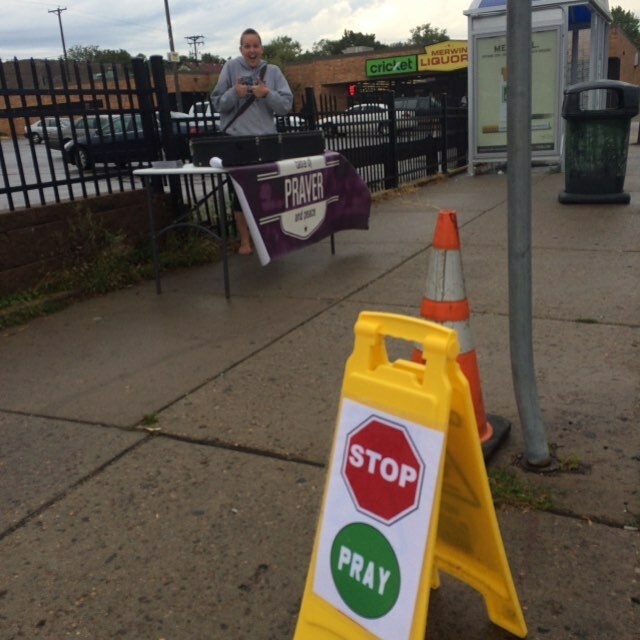 We talked to a couple others while we set up a prayer and worship table on the busy corner. It was a joy for me to sing songs of worship to the God I love on that busy and often troubled corner. Every Thursday night we host a group of neighborhood kids with our partners Antioch. We share life, Bible stories, meals, games, and homework. Tonights lesson was on Rahab and having courage. On the way home one of our teenage girls saw a group of about 15 of her friends. As she stopped to talk, the group expressed their concern over a 2 year old boy who was lost and wondering the streets. He didn’t know how to get home and they were staying with him to figure out what to do. I happened to know the boy from the 810 community and was able to lead the group back to his house. I was able to thank and encourage the group before I took the others home. On the way back to my house, I was contemplating all this and was reminded that these teens were doing the Gospel. There was a boy who was lost and could not find his way back home. Someone had to come and who knew the way and rescue him. These teens were living the Gospel! I was regretting not being able to think of this earlier, when I spotted the group again and quickly pulled over. They were messing around in the street, and as I got out of the car, one mentioned “he’s about to get you!” thinking I was mad about them blocking my vehicle. I smiled and thanked them again for their help earlier. “Have you heard the Gospel?,” I asked the group of 15. I shared my little analogy with them and 2 in particular were very interested and stayed back to pray with me. One in particular said he wanted to be a pastor when he was 9, but didn’t have anyone to show him how to follow Jesus since his uncle left. He wanted to follow God, but was often running the streets doing things he knows he’s not supposed to. I was able to get his number and will be following up with him tomorrow. Doing what God has called me to do, in the place He’s called me to be, at the proper time. There is nothing better. I know tomorrow is another day, but I had to share these thoughts while they’re fresh on my mind:) God is at work. God does see. He is establishing truth and justice, and He will be coming to rule and reign. It is my joy to fellowship and work with Him as He accomplishes His purposes here on earth.